Coolaroo eleven foot round aluminum outdoor umbrella incorporating the unique breathable Coolaroo knitted fabric. This fabric is designed to draw up cool air while releasing hot air through the umbrella top. This action allows the area underneath the fabric to be cooled down by as much as one third in comparison to the surrounding air. 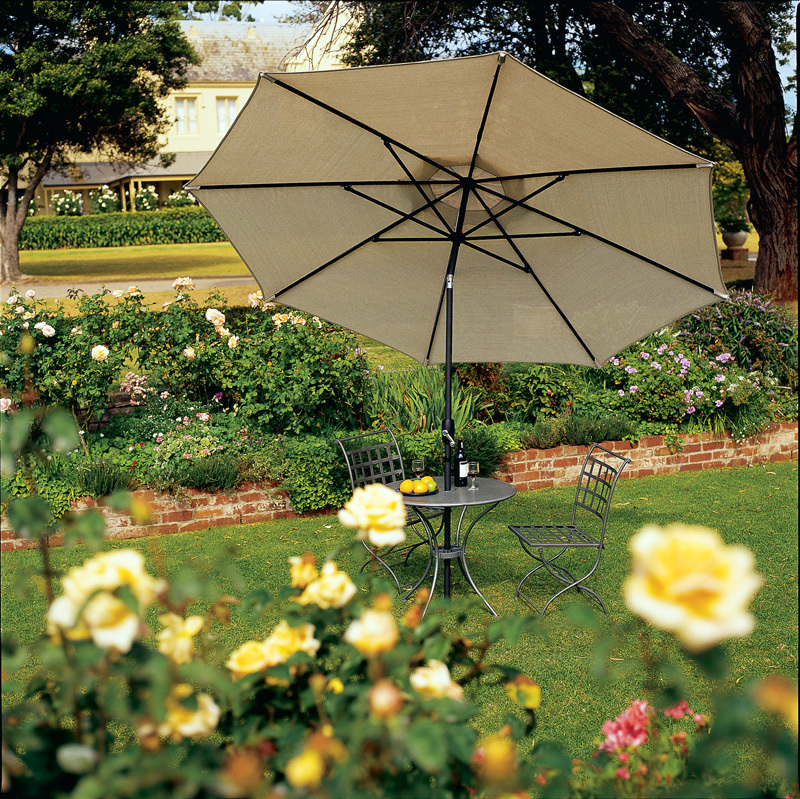 Aside from the fantastic cooling ability of the Coolaroo fabric you'll find all the other great features of this 11 foot outdoor umbrella such as its three position tilt and smooth action crank mechanism that will provide shade at most any time of the day as well as make it easy to crank the umbrella up and down. Plus the fabric is resistant to fading, mold and mildew and very easy to clean and that is in addition to blocking out up to 90% of the sun's harmful U.V. rays. This eleven foot round aluminum patio umbrella is the largest diameter in the Coolaroo line and carries an unprecedented five year warranty on the Coolaroo fabric and is built around a corrosion resistant frame making this an outdoor patio umbrella that's sure to keep you cool and last for a lot more than a single season.